The Company Phone Numbers section of your AT&T Office@Hand online account provide general information about your company’s phone numbers. Administrators can access these sections on the Online account by going to the Admin Portal > Phone System. Account administrators can assign names or labels to Company Phone Numbers. These changes get synchronized across your Office@Hand phone system. It helps both the Administrator and Users to easily locate the number when configuring the advanced call handling rules, outbound Caller ID, or reassigning a direct line. This feature helps you save time spent in going through a long list of numbers in your Office@Hand Online Account, Desktop app, and Mobile app. Note: This feature is available to all plans with the Enterprise UI enabled. The Phone Numbers section of your account shows your Company Main Number, Company Fax Number, and all numbers assigned to your users. The Company tab shows the list of your Company Numbers; Company Main Number, Company Fax Number, and all numbers assigned to the company Auto-Receptionist. The Assigned tab shows the list of phone numbers directly assigned to an extension or user in your account. 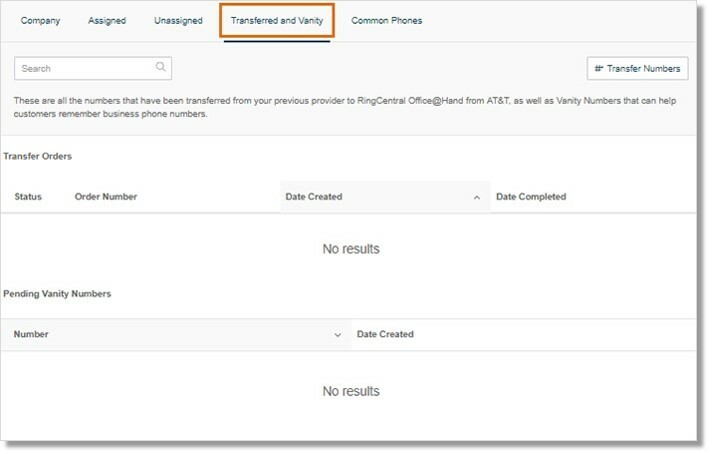 The Unassigned tab shows the list of phone numbers assigned to a Desk phone or Soft phone (Desktop app), but not to an extension or User. The Transferred and Vanity tab shows the list of your pending Number transfer or Vanity orders. The Common Phones tab shows the list of phone numbers assigned to your Common Phones.